Water scarcity and flooding constitute major problems for developing countries located within the tropical climatic region of Southeast Asia. In addition, regional water consumption is increasing, and water usage patterns have been changing recently. Therefore, an advanced water resource management framework that considers both water supply and flood control is needed. Multipurpose reservoirs are widely used to manage water resources efficiently; however, water-related problems occur with reservoirs in Southeast Asian watersheds because of inadequate operation rule curves. We developed a method for constructing optimal operation rule curves for Dau Tieng Reservoir, which is one of the largest multipurpose reservoirs in Vietnam. The reservoir is used for flood control, domestic water supply, industrial uses, environmental flows, and agricultural uses, in the order of priority. The operation rule curves of the Dau Tieng Reservoir comprise five reference water levels: the retarding water level, upper water level, lower water level, critical water level, and dead water level. Water release from the reservoir is determined based on the relationship between the reservoir level and the rule curves. In this study, the rule curves were newly determined using the shuffled complex evolution method of the University of Arizona (SCE-UA method). 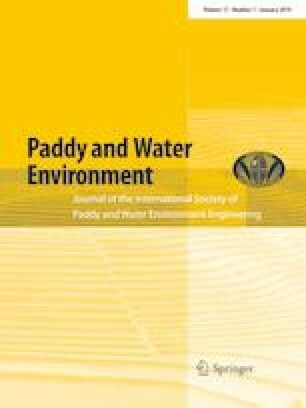 The objective function for optimization was defined by focusing on the improvement in insufficient supply for agricultural uses and environmental flow downstream of the Dau Tieng Reservoir. Inadequate solutions were prevented by introducing penalty functions into the objective function. Experimental results indicate that the proposed optimization method efficiently searches for optimal rule curves. The authors greatly appreciate funding support under JSPS KAKENHI (Grant Number: 18H03968).